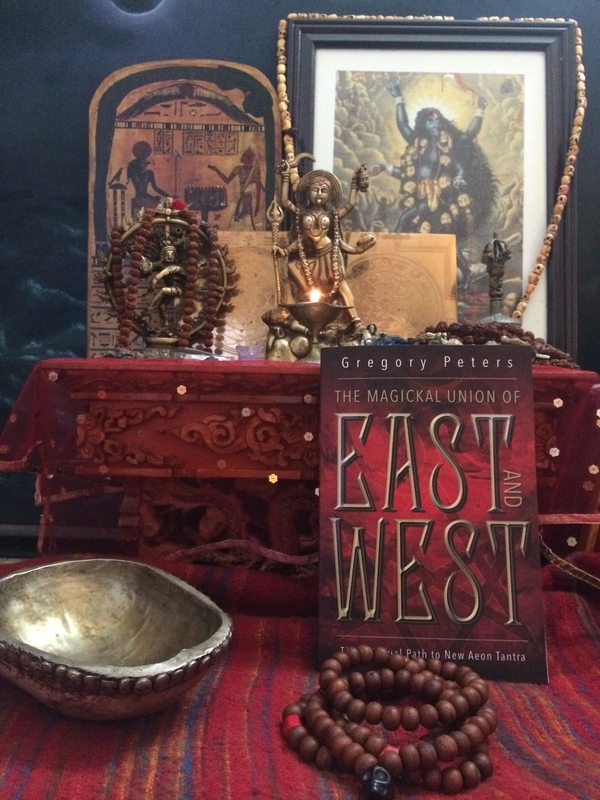 A new article is posted from my book The Magickal Union of East and West entitled Thelemic Refuge . Enjoy! In my book The Magickal Union of East and West, there is a description of a practice from ashtanga yoga, the Surya Namascar (“Sun Salutation”). While the description is traditional, without instruction it can be difficult to follow. My friend Andria Degens is certified instructor of yoga with her own practice in Hastings. She has studied and practiced extensively in India and the UK (see her full bio here). Andria kindly agreed to illustrate the major asanas of the sun salutation in order to augment the description in the text. With these photos and the outline given in the book, it should help to make the practice a bit easier to decode and get into for beginners. If you are in the Hastings area, by all means sign up for her classes and get first hand practical instruction in this and deeper aspects of yogic disciplines. She also offers private one on one classes for serious students that wish to pursue the work in customized sessions. In addition to her love of yoga, Andria is a musician with many albums out, performing under the name Pantaleimon. The description is from pages 12 -14 of The Magickal Union of East and West. Photo credit goes to Dave Reading. The yogini is of course Andria herself. Stand straight, with your feet together. Imagine a brilliant white sphere above your head with a white light streaming into it from above. Place your palms together, touching your chest. Sense the energy pouring into you, filling you with vitality and awakening every cell of your body. Now breathe in deeply while you raise your arms above your head and bend backward from the waist. Bending forward from your hips, breathe out slowly. Knees should be slightly bent (you do not want any strain on your lower back). Hands are flat on the floor beside your feet. At this point, your head should be near your shins. Breathe in and stretch your right leg behind so that your foot is at a right angle to your leg and resting on its toes. The left leg is vertical to the floor and your head is back. While you breathe, place your left foot back to match the right foot. The body is now in a straight line, supported only by your toes and hands, which are in a vertical line. Still holding your breath, lower your body and rest your toes, knees, chest, palms, and forehead on the floor. Stomach and pelvis are off the floor, with hands by your shoulders, elbows bent, and arms by your sides. Breathing out, lie flat on the ground. Feel the energy coursing through your body. Breathe in as you raise your head and then the upper part of your torso. Pelvis is flat on the ground and the head is back. Hold your breath and bring your feet flat onto the floor and raise your hips to form an inverted V shape. Still holding your breath, bring the right foot forward so that it is vertical and the left leg is back (the reverse of #4). Breathe out as you bring the left leg up and place your feet to- gether between your hands. Straighten your legs (with knees slightly bent) and place your head on your shins. Breathe in as you straighten up from the hips. Bring your arms up, and stretch them backward as you bend back from the waist. Hold your breath as you look backward. Breathe out as your straighten your body. Now raise your arms over your head and back again as you bend your elbows to place your hands together at your chest. See a radiant sphere of golden solar energy in your heart center, its rays penetrating and warming your entire body. The Llewellyn Magick Update with my article, and lots of other good stuff, now available!